Architect and Byzantine architectural historian Paul Atkins Underwood had a career at Dumbarton Oaks that spanned over twenty-five years. He was born on February 22, 1902, in Aguadilla, Puerto Rico, where his mother and father, a Presbyterian missionary, had been stationed. He attended Princeton University, receiving baccalaureate and master’s degrees in architecture in 1925 and 1928. He spent two years as an architect just before the beginning of the Great Depression. With the nation’s economy in shambles, his ability to find work as an architect quickly dwindled and, faced with poor career prospects, he decided to redirect his life. In 1931, Underwood went to Greece for three years where he fell in love with the culture and took a particular liking to the abundant classical and medieval architecture. Inspired by his experiences in Greece, he returned to the United States and began graduate studies in medieval architectural studies at Princeton, where he would study under Dumbarton Oaks affiliates Charles Rufus Morey and Albert Mathias Friend Jr. After completing his graduate studies and a short stint of teaching at Cornell University, Underwood was accepted as a junior fellow at Dumbarton Oaks between 1943 and 1946. In 1946, he was appointed resident assistant professor of Byzantine art and architecture at Dumbarton Oaks. During his tenure as a junior fellow, Underwood studied the Lateran Baptistery in Rome, the relationship between Early Christian baptisteries and Greco-Roman tholoi, and the iconography of the “Fountain of Life” as depicted in early gospel manuscripts. This latter research resulted in the article, “The Fountain of Life in Manuscripts of the Gospels,” which was published in the Dumbarton Oaks Papers 5 (1950) (read online). 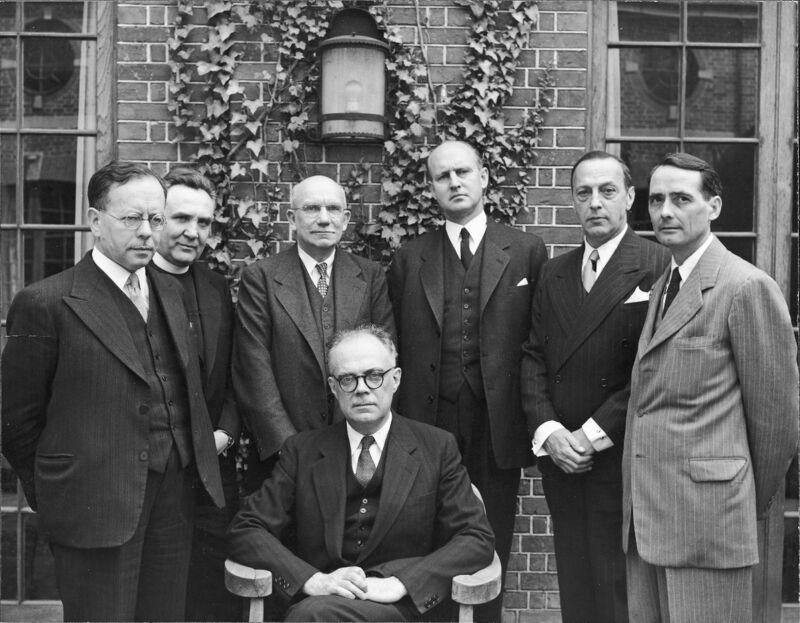 Speakers at the 1950 “The Emperor and the Palace” Byzantine symposium, from left to right: A. Alfoldi, F. Dvornik, A. M. Friend, H. P. L'Orange, E. Kantorowicz, P. Underwood, and A. Grabar (seated). It was also at Dumbarton Oaks that Underwood began collaborative work with scholars such as Glanville Downey, then assistant professor of Byzantine literature, and Underwood’s former Princeton mentor Friend, then director of Byzantine Studies at Dumbarton Oaks, on the reconstruction of the lost Church of the Holy Apostles in Constantinople. They began this work during the 1945–46 academic year, and it continued unabated until the symposium in 1948. Their interest was to articulate the church’s plan, elevations, and mosaic programs. After the symposium, research on the church began to falter, however, and the anticipated publication never materialized. Underwood had become engaged in a study of the topography of Constantinople, made possible by the end of the Second World War and Europe’s return to a degree of normalcy. Indeed, he spent the autumn of 1949 making topological and archaeological investigations in Istanbul. After his return to Dumbarton Oaks, he was consumed with reconstructing the architecture of the Sacred Palace, particularly that of the Daphne Palace of Constantine, work that would lead to his participation in the symposium of 1950, “The Emperor and the Palace,” under the direction of André Grabar. In 1950, Underwood left Dumbarton Oaks when he was appointed field director of the Byzantine Institute in Istanbul, after the death of the Institute’s founder and director, Thomas Whittemore. With the assistance of Whittemore’s former second-in-command, Ernest Hawkins, Underwood opted to work “on loan” from Dumbarton Oaks, and while based in Istanbul, Underwood divided his attention between both Dumbarton Oaks and the Byzantine Institute. As field director, Underwood managed conservation work at the Hagia Sophia and Kariye Camii, among other locations. Using information generated in the field in Istanbul, Underwood compiled reports to be published in the Dumbarton Oaks Papers (Kariye Camii: volumes 9/10 , 11 , 12 , 13 ; Hagia Sophia: 15 ; other work of the Byzantine Institute: 9/10, 12, 13, and 14 ). For these and other contributions to Dumbarton Oaks, Underwood was appointed associate professor in 1951 and professor in 1960. In 1963, Underwood began to advise Father John Tavlarides at the newly built Saint Sophia Cathedral in Washington, D.C. He recommended that the mosaic iconographic program for Saint Sophia should follow the programs introduced in Constantinople in the second half of the ninth century by the great theologians of the period following the end of the iconoclastic controversies. He became head of the interior decoration committee for Saint Sophia, and in this capacity supervised the mosaic artist Demetrios Dukas in the creation of the mosaic decoration from 1964 until Underwood's death in 1968. Beginning in 1966, Underwood’s The Kariye Djami, was published. His magnum opus, the four-volume work (three of which were published during his lifetime) focused on Underwood’s examination of the mosaics and frescoes of the titular monument during his years in Istanbul. For its importance as an art history resource, the College Art Association of America awarded The Kariye Djami the Charles Rufus Morey Award in 1970. Underwood died on September 22, 1968. During the course of his long, rich academic career, he had contributed much to the knowledge of Byzantine buildings.